The pattern of crop genetic diversity in the developing world has changed over the past two centuries with the modernization of agriculture, accelerating with the advent of the green revolution. Since the green revolution, the locus of agricultural research has shifted from the public to the private sector. The growing importance of the private sector in agricultural R&D is changing the types of crop technologies that are developed and the ways they are delivered to farmers, perhaps best illustrated by transgenic crops which are being developed and commercialized almost exclusively by private multinational companies. The spread of transgenic crops will influence crop genetic diversity, but their implications for the availability of plant genetic resources and the resilience of agricultural ecosystems are not entirely clear. Transgenic crops, per se, may increase or decrease crop genetic diversity, depending on how they are regulated and deployed. 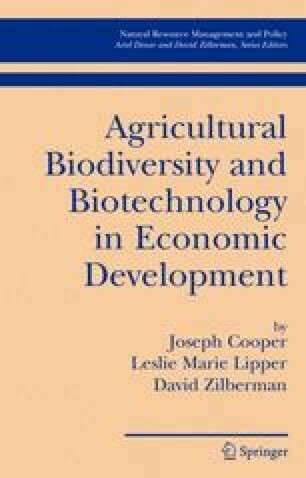 This paper explores a range of policy options to increase the likelihood that private sector R&D, particularly in the form of transgenic crops, enhances rather than erodes crop genetic diversity.